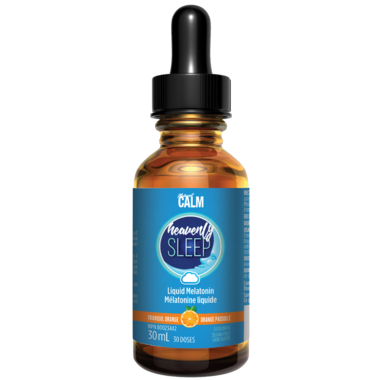 Natural Calm Heavenly Sleep Liquid Melatonin is fast-acting. Melatonin is a natural hormone that we all produce. It’s activated by magnesium – the hard-working mineral that helps relax nerves and muscles. When we have healthy sleep patterns and enough magnesium, we naturally produce the melatonin we need to fall asleep fast. Is an adult, primarily over the age of 40. When you supplement with Natural Calm Heavenly Sleep Liquid Melatonin, you activate your body’s own natural cues to sleep, drug-free. That’s because liquid melatonin is absorbed more quickly than tablets, so the trigger to sleep is released right away. Get the rest you need, when you need it, and feel refreshed in the morning. Suggested Use: At or near bedtime, add 1 dropperful of Heavenly Sleep to your cup of Natural Calm, or take with water. 1 dropper equals 1ml (3 mg) of melatonin. Each bottle of Heavenly Sleep Liquid Melatonin contains 60 ml for 60 nights of sleep. Love this product works quickly and is effective.